Our schools serve over 34,000 students from 190 towns and countries. I have often written that Catholic schools are places of hope, places where children learn to know, love and serve God because they are known and loved by the adults in their schools. I believe strongly in the ability of Catholic schools to help children develop their own relationships with Jesus. I also believe that our schools are places where the teaching and learning processes are doing well and children are learning. I have data to suggest all that I have written is true and, through this column, I want to share some of our data. 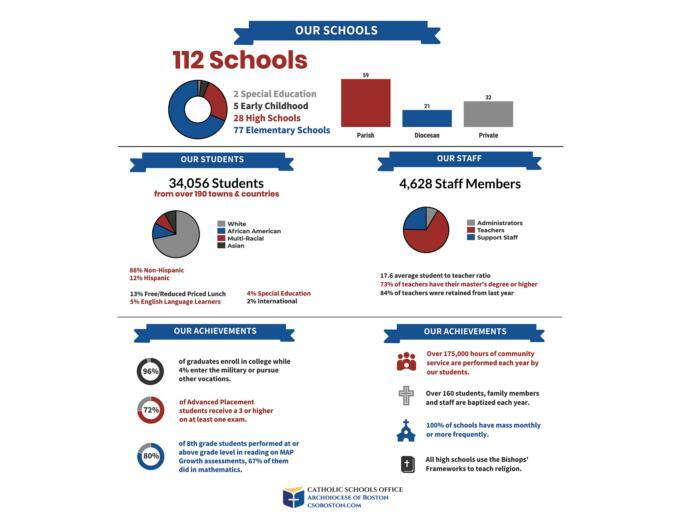 In the Archdiocese of Boston, we have two special education schools, five early childhood centers, 28 high schools and 77 elementary schools. Fifty-nine of our elementary schools belong to parishes, while 21 of the high schools are entities of the Archdiocese of Boston. Our schools serve over 34,000 students from 190 towns and countries. Our student bodies are diverse. While 71 percent of our students are white, 12 percent are Hispanic, and another 11 percent are African American. We serve students from various economic backgrounds, with 13 percent of our students qualifying for free and reduced lunch. Five percent of our students are English-language learners, while 4 percent are students with special learning needs. Generally, our schools reflect the population of the neighborhoods where they are located, yet none of our schools serve students from fewer than five zip codes. Our teachers are very qualified to teach our students. Seventy-three percent of them hold a master's degree or higher and they are engaged in professional development activities throughout the school year and summer months. Through the work of Mary Goslin, who works with schools to access federal funds for our teachers and students, we have increased the amount of professional development in which our teachers participate, while also increasing the number of services our students receive. In addition to developing our students' minds and spirits, we are also working to do the same for our teachers. All schools provide annual activities for teachers to learn more about our faith and to assist them in their own faith journeys. Teachers and staff members go on retreats, take college courses, and work together to serve people in their school communities. Our teachers collect money for their school families in need, provide food for students, and continually spend their own money to provide more materials and resources for our students. The work of our teachers results in schools where students feel like they are part of a larger family. Each year, we see greater academic growth and achievement in our students. Seventy-two percent of the students who took an Advanced Placement (AP) exam scored a three or higher. Elementary students are building things with 3-D printers that they have programmed, while they continue to read the classics and study the lives of saints. Our students are exploring math and designing bridges, while creating art that truly expresses the love of Jesus that they are taught every day. Our students are learning how to behave ethically, as well as learning to serve. Last year our students performed more than 175,000 hours of community service and raised thousands of dollars to assist victims of the fires in California, the hurricanes in Texas, and other local groups that suffered from natural and manmade disasters. It is because of these things that our students develop into people who continue to volunteer and work tirelessly for the poor and underserved throughout their lives. No one makes an educational dollar go further than our school leaders! Average elementary school tuition in the archdiocese is $6,056. Average high school tuition is $15,699. That is a lot of money for a family to pay and not enough money for a school to operate. Therefore, fundraising is critically important to our schools. Without the work of each school to raise scholarship money and the generosity of the Catholic Schools Foundation and the Campaign for Catholic Schools, fewer students would be able to attend a Catholic school. Approximately $30 million in financial assistance was distributed last year and we are grateful for the efforts of local schools and parishes, the Catholic Schools Foundation, and the Campaign for Catholic Schools. We are blessed in the archdiocese with a tradition of excellence and we will continue to work hard to build on that tradition each day. We ask for your support and your prayers, as we continue to help our students to go further with faith. 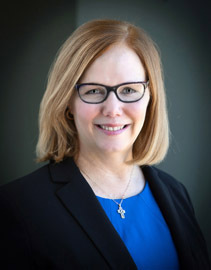 Kathy Mears is Superintendent of Catholic Schools in the Archdiocese of Boston.